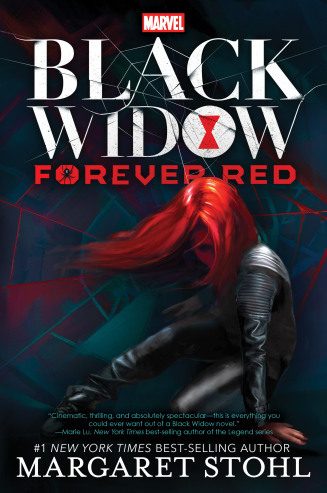 I was a very lucky duck and picked up an advanced review copy of Margaret Stohl’s Black Widow: Forever Red at BEA this year. I promptly read it and mailed it along to an internet friend. While I jotted down notes immediately, I didn’t pull together the review until just now. If you’re keeping score at home, that puts me several months from the reading experience, and with a slightly different view of the book and its merits. Here’s what I know (now): Black Widow: Forever Red is a thrill. It’s fast-paced, satisfying action from start to finish, and I loved the heck out of it. Just don’t ask me to quote back any of the dialogue or narrate the fight scenes! Natasha Romanov was once the world's most lethal assassin. Trained from a young age in the arts of death and deception, Natasha was given the name "Black Widow" by her brutal teacher, Ivan Somodorov. Now, Natasha wants nothing more than to leave that life behind her. Ava Orlova is trying to live the life of an average American teenager. But Ava’s life has been anything but average. As a girl, she was experimented on by Ivan, until she was rescued by Black Widow and placed in the care of the US government. Ava spent years trying to contact her mysterious savior, but Black Widow has always stayed silent. When children all over the globe begin to go missing, Natasha suspects her old teacher has returned. And Ava may be the key to stopping him once and for all. But first Natasha and Ava will have to unravel their pasts to defeat the madman who threatens their futures.This novel features all the thrilling adventure readers will expect from the Marvel brand, backed up by the young-adult cred of #1 New York Times bestselling author Margaret Stohl. Uncover a new side of the Marvel Universe, accessible to old fans and new readers alike, as Stohl weaves an unforgettable story through the world of the Black Widow. Ana is a teenage orphan who once was a pawn in a sinister experiment that involved the infamous Black Widow. Alex is an impulsive, likeable high school fencer who sometimes feels like he doesn’t fit in his own life. Natasha Romanov is a spy, a manipulator, and an Avenger. She has avoided contact with Ana, even though she claimed kinship with her once, years ago. That all changes when Ana’s and Alex’s lives intersect, world-changing secrets are revealed, and the Black Widow’s old nemesis rises from the ashes. The writing encourages you to expect a certain outcome, but the story itself tricks you into forgetting that – so the reader should be surprised, even if they’re the type to half expect that a twist is coming. Basically, Stohl is clever, and it comes out in the book in the best of ways. There’s also a dual narrative voice structure to consider, with interrogation transcripts, flashbacks, and bits of memories (some of them unreliable). As for pacing: after an action- and explosion-filled first few scenes, the story slows while new characters and mysteries are introduced. It soon picks up again though, and familiar (beloved? )(people love Tony Stark and Coulson, right?!) Marvel characters make appearances as well. It’s a fast-paced book with all of the scene changes an action flick fan could want. Pros: The story is an easy read, the plot is high stakes, new characters fit into Natasha’s back story seamlessly (and you end up caring about them!). There are satisfying action sequences, and the secrets, spy games and possible world-ending doom all meet and/or exceed expectations. Add to that a tiny splash of romance, and the result is pure entertainment. Cons: There might be a bit of reader drop-off in that one “slow” bit between the opening hook and the first action (where a lot of the exposition/set-up happens). I’m also not sure how broad the appeal of a Black Widow book is. I think she’s a great character and anyone/everyone should check out this book, but if a reader hasn’t seen most of the big Marvel films to date, there may be some confusion as far as story context. That said, this book will delight Natasha Romanov/Black Widow fans of all ages, and likely convert a few interested bystanders into full-fledged Marvel geeks (like me). Recommended for: devotees of Marvel universe, fans of political intrigue and spies going rogue, those who enjoy plot- and action- heavy YA fiction, and anyone who likes the Mission Impossible, Bond, or superhero movies. Requisite (sinister) Russian villain included at no extra cost. Fine print: I picked up an ARC of this title at BEA for review consideration. I did not receive any compensation for this post. Oh my gosh this looks and sounds like such a fun read!